For East Bay Appointments click here. OrthoDIRECT West, located in West Warwick, joins University Orthopedics with clinic locations in Providence, East Providence, Middletown, East Greenwich and Barrington, University Orthopedics is a regional center for orthopedic and rehabilitation care with specialties in back and neck pain, joint pain, sports medicine problems, shoulder pain, hand problems, hip and knee pain, pediatrics and foot and ankle injury. 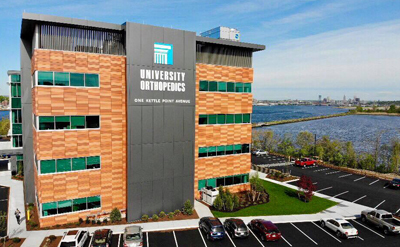 UOI includes more than 40 board certified, fellowship trained musculoskeletal and sports medicine physicians. These specialists are faculty members of the Department of Orthopaedics at the Warren Alpert Medical School of Brown University who teach medical students, orthopedic residents, and fellowship subspecialty surgeons. University Orthopedics leads the way with Basic and Clinical orthopedic research on the latest advances in orthopedic surgery and injury prevention. OrthoDIRECT, a division of University Orthopedics, provides patients with access to acute orthopedic care. Offering same day and next day appointments, OrthoDIRECT is staffed by orthopedic-trained physicians to ensure that all patients receive an accurate diagnosis and appropriate treatment plan. On-site X-ray technology is also available to provide an expeditious assessment of orthopedic needs. Patients with major commercial insurances are eligible for treatment at Ortho Direct. What do we treat at Ortho Direct? FOR SERIOUS INJURIES SUCH AS HEAD TRAUMA, SPINE INJURIES AND OPEN FRACTURES PLEASE SEEK TREATMENT AT YOUR CLOSEST HOSPITAL EMERGENCY ROOM. PLEASE DO NOT SEEK TREATMENT FOR CHRONIC INJURIES, PAIN MEDICATION OR SECOND OPINIONS AT ORTHO DIRECT. OrthoDIRECT physicians are committed to delivering a higher level of orthopedic care. Personalized patient evaluations ensure acute orthopedic concerns are addressed immediately, helping to reduce patient pain and discomfort.